Mike and Ike Red Rageous Candy 24ct box - Experience this outrageous blend of your favorite red fruit flavors ! 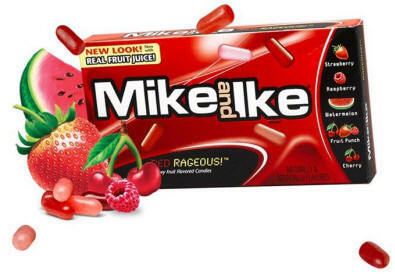 MIKE AND IKE combined our most popular red bean flavors to create a fruit flavor sensation. This winning combination includes Cherry, Strawberry, Watermelon, Raspberry, and Fruit Punch. Experience this outrageous blend of your favorite red fruit flavors ! MIKE AND IKE combined our most popular red bean flavors to create a fruit flavor sensation. This winning combination includes Cherry, Strawberry, Watermelon, Raspberry, and Fruit Punch.